Hurricane Maria's rampage through Puerto Rico left neighborhoods destroyed and the entire island without power. Shops powered mostly by generators are now reopening. Roads are being cleared. But thousands of people are homeless. NPR's Greg Allen visited a temporary shelter in a town that's been flooded. 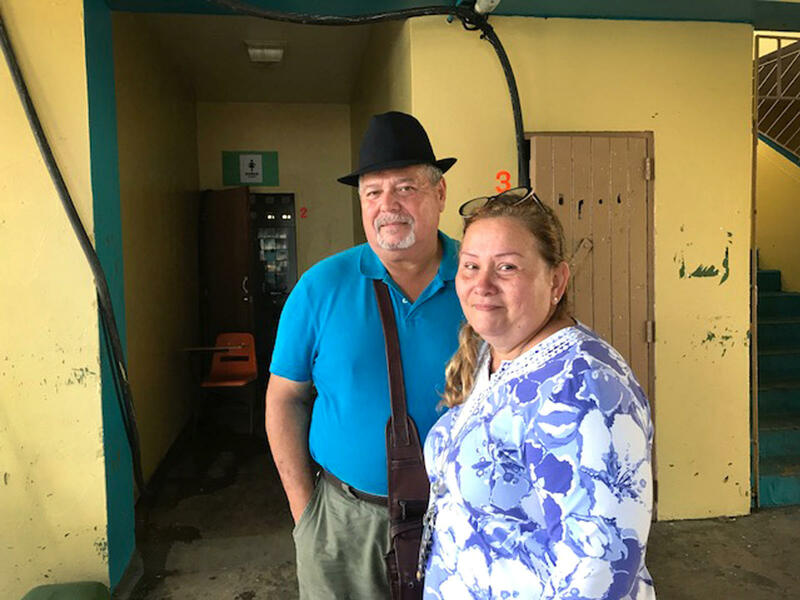 GREG ALLEN, BYLINE: The town of Catano on Puerto Rico's northern coast is a low-lying community where residents don't have a lot of money. The water rose quickly here when Maria hit last Wednesday. Irma Rivera Aviles, like nearly 200 others, now is stuck in a shelter where conditions are getting worse daily. IRMA RIVERA AVILES: (Speaking Spanish). ALLEN: "The governor needs to come here and take a look at our critical situation," she says. "The bathrooms are flooded and aren't working. Sewage is spilling all over. The generator's broken, and we're here in the dark. We desperately need water, power and ice." Rivera is a Catano City councilperson who helped set up the shelter here. She evacuated before the storm because she has a house made of wood close to the water's edge in Catano. After Maria passed, when she returned, what she found shocked her. ALLEN: "The entire roof was blown off," she says. "Everything got soaking wet - the beds, furniture, everything. The walls are caving in, and water is still leaking in." Although there's food provided at the shelter, there is no running water. At night, she says, with no power, residents are left in the dark and are awakened sometimes by the sound of gunshots nearby. But for Rivera and others at the shelter, their biggest worry is health care. ALLEN: "My husband is a kidney transplant survivor," Rivera says. "He's diabetic, and we don't have ice to store his insulin." She opens up a blue cooler where she's trying to keep her husband's insulin cold. ALLEN: Oh, yeah. So that's all the medication that - his insulin. And the water's all melted now. 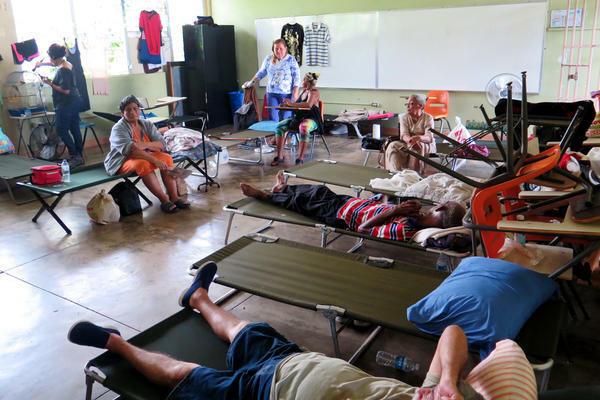 ALLEN: Authorities in Puerto Rico say there are more than 10,000 people in shelters across the island because their homes were destroyed by Hurricane Maria. 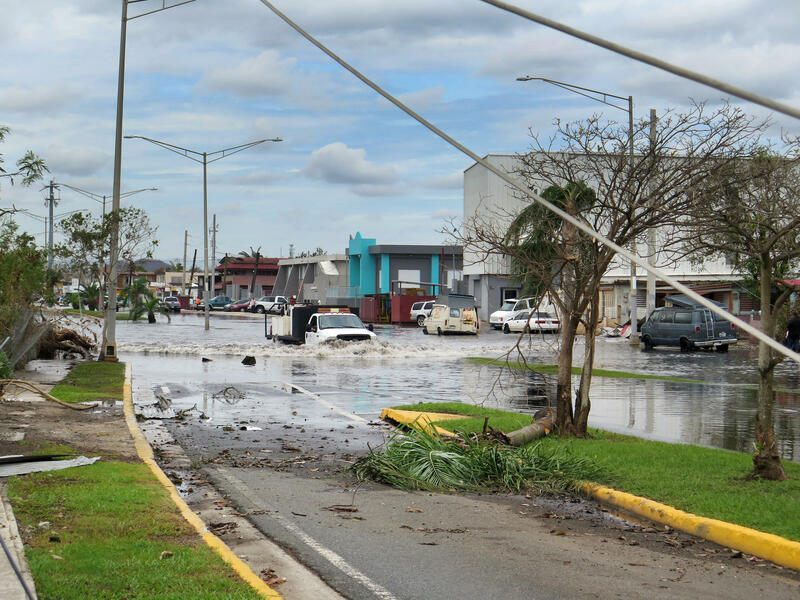 FEMA and relief groups are delivering food, water and generators to the island. But in Catano, they say, so far, no outside help has arrived. Nearly a week after the storm, some areas here are still flooded. I found 77-year-old Maria Escalera calmly pushing her walker through water up to her shins. ALLEN: She says she has enough food and water at home but wanted on her nephew whose house is in the flooded area. ALLEN: She's thankful that she and her husband who is blind are alive. Her biggest worry, she says, is that she lost her dentures in the storm. ALLEN: Outside the Catano Minimarket, a line stretches around the building. Customers like Malena Quinones are thrilled because the word is out. Banks are back online. Their debit cards are working. They can buy badly needed supplies. MALENA QUINONES: Bread, cheese, ham, everything - everything you need. We have water. ALLEN: In San Juan, there are lots of lines now - lines of cars at gas stations waiting for tank trucks to arrive and gas to begin flowing again, outside banks where people for the first time since the storm have some chance to withdraw cash, along the sides of highways where cars line up in places motorists have found good cell phone signals. The government here reports some signs of progress. Water is slowly coming back in some areas. One of the most hopeful signs - Puerto Rico's Power Authority says it's restored electricity to two big hospitals in the San Juan area. And power is back on in part of Mayaguez, a city on the island's west side far from the center of Maria's destruction. Greg Allen, NPR News, San Juan, Puerto Rico. Transcript provided by NPR, Copyright NPR.